How is it that we get overwhelmed by problems and struggle to find a solution, when others do not? If you want to find out you need to check out “Hidden Solutions All Around You” by Daniel R. Castro. As a retired business analyst/accountant, this book intrigued me right away, in hopes it was just not another repetitive business self-help book, like so many out there, which only point out the basics or the obvious. By the end of the introduction, I knew this was not the case. Castro begins by opening the reader’s mind so that they can realize how vast the universe of possibilities really is. Once realizing this, it is impossible to go back, as the reader will understand the amount of solutions to any problems are just as vast. Once the mental wall we all build around ourselves crumbles, the reader will discover a new world of life changing ideas and point of views. Castro does an amazing job producing a complex trend of thought in a simple format that is easy to understand and to put into practice. His ability to capture the mind of the reader with his storytelling writing style, and his simple, straight to the point format won me as a fan. I found so many enlightening ideas for my own business that from the beginning I struggled between wanting to stop reading to go to work and not wanting to put the book down to learn more! At the end of each chapter, Castro also helps readers to grasp the main idea. This makes it easier to re-visit when needed. 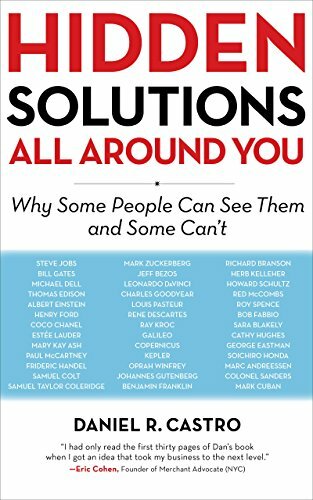 I cannot say enough how much I liked “Hidden Solutions All Around You” by Daniel R. Castro. It is by far the one book that I will keep close by me throughout the year. A five star must read!